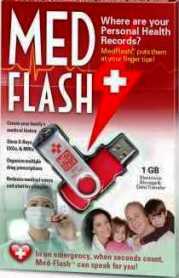 MedFlash™ by Connectyx is a new revolutionary HIPAA compliant safety device as of 2008. It is an industry-leading safety device that stores critical personal medical information, prescribed medications, x-rays, MRIs, and lifestyle information in a small flash drive in a format that can be retrieved in a flash if needed in an emergency situation. The possibilities are endless with this lifesaving device. Nursing homes, hospitals, caretakers, family members or if just needed personally to store your critical information in one spot in case of emergency, MedFlash is the device to have when the need for emergency care is needed quickly. In an emergency, the stored emergency flash drive medical file can easily be accessed by medical personnel or first responders without any special software; whereas the responder can spend more time helping you or another in need rather than time trying to find the information needed so treatment can be administered.